I AM A SONIC BOOMER, NOT A SENIOR... In this blog, I am writing to and for those who believe that the Boomers will change what the word Senior means. I also believe that Boomers will change what retirement means in our society. The blog is also for those who are interested in what life after retirement may look like for them. In this blog I highlight and write about issues that I believe to be important both for Seniors and working Boomers. Traditionally, women spent their adult lives married, so it made more sense to study households rather than women separately. The question is whether today’s women are spending fewer years married. The analysis looks at four birth cohorts, ranging from the Depression Era to Mid Baby Boomers. No matter how you define the age span, the percentage of years spent married has dropped from about 70 percent to 50 percent. The reasons are three-fold: 1) fewer women get married; 2) when they do marry, they get married later; and 3) more women end up divorced. Approximately 50% of Boomer women get divorced. Thus, looking at women’s finances separately from men is increasingly necessary for a full assessment of their retirement security. The bottom line is that women as a group are going to spend less than half of their adult years as part of a couple. This pattern reflects an increase in age at first marriage, a decline in marriage rates, and an increase in divorce. It shows up across race and educational attainment. This change has significant implications for financial planning. The Center’s work goes beyond economics. They study the behavioral factors that drive individuals’ decisions so they can craft solutions that work in practice, not just in theory. Visualization And Weight Loss - See The Pounds Drop Away! 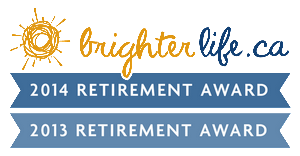 In 2014 and 2015 I had the honor of being selected as one of the top ten best retirement writers in Canada by Bright Life.